so, very early in the development of the Tableau software, they found that their software wasn’t able to fulfil its potential in terms of performance, simply because of the data. what do I me a by the data? well, it so happens that DBAs are very smart people but it also happens that a lot of them don’t have databases that are tuned as best as they could. Heck, I will go as far as to say that a lot of those databases are very poorly maintained. so what happens when you connect to them? well, you get used to taking long breaks. this obviously didn’t sit well with Tableau. so, what did they do? They did what great innovating companies do. they created their own format for storing the data. Thus was born TDE. A highly performing columnar based technology for storing data. 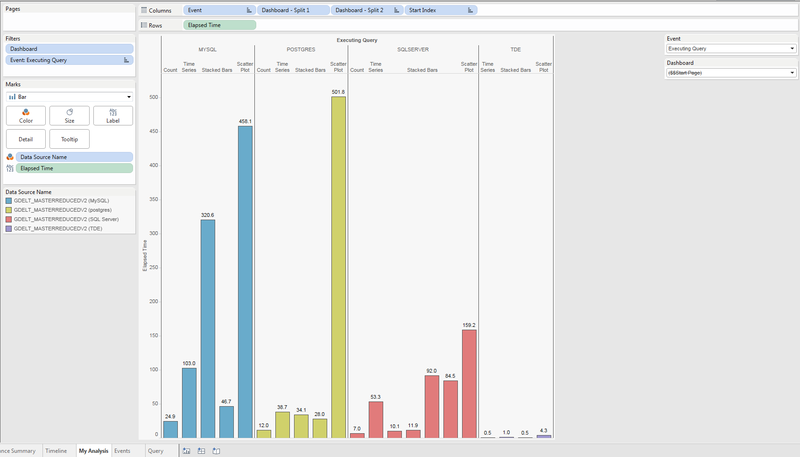 I am providing some data about what a Tableau Data Extract may be able to do for you. You are a data worker, you have 25M rows with a bunch of dimension (let’s say about 10) and you would like to do some analysis on it. Now, you are a little bit technical, not to be a DBA but enough to read about databases, maybe install MySQL, and guess what? As you can see above, I have on the top-left a count of rows, then on top-right a trend over time, then on bottom-left, a stacked chart and bottom-right, a scatter plot. 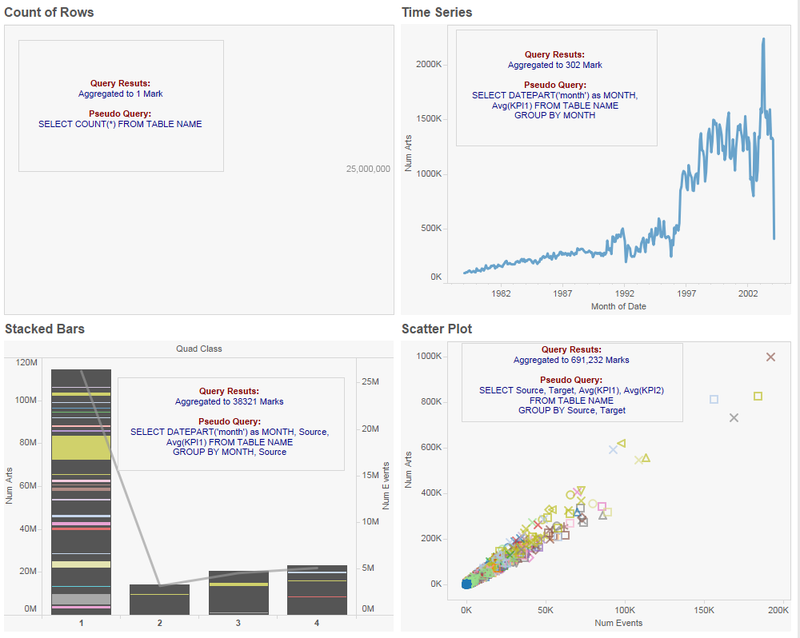 Now, as you can see there are HUGE performance gains when you use a Tableau Data Extract in the scenario above. Quite frankly, you will probably get pretty awesome performance gains compared to most databases out there. But, please please (I beg you) don’t use TDE as a silver bullet for your performance issues. See, the TDE is a copy of your data and once you have created a copy, you need to think about ensuring you can trust this data as much as you can trust the original source. when and when not to create an unnecessary copy of your data. In other words, don’t create a TDE chaos regardless of whether you decide to go with TDEs or not. These need to be managed just like any other data source. I can not emphasize this enough. Please don’t create a mess that you can’t manage and then hand it over to someone else to manage. Next What happens when I click the Performance Recording in Tableau?